It is so very nice to have kind and caring friends. It is a rarity nowadays to come across a genuine person. Although, a rarity of homegrown food should be a thing of the past and a way of wholesome life. Yesterday, super fun, honest and sweet friend brought her own homegrown cranberry hibiscus for my family to try. I was quite surprised and amazed to taste a real flower brewed in the freshly boiled tea cup and not an old store-bought tea packet. The deep maroon color is spectacular, authentic and the taste is quite potent. Just a couple of brightly colored hibiscus flower leaves will do perfectly for a home-brewed cozy tea beverage. Very grateful to have this dear person, who restores my faith in humanity; moreover grateful for being inspired to write this post. Because of the authentic lady friend, these beautiful edible flowers are being shared with the rest of my friends. This Plant is a perennial shrub in the subtropics and tropics but can be grown as an annual in cooler climates. It grows rapidly to 1.7 m high with deeply cut leaves similar to Japanese maple. 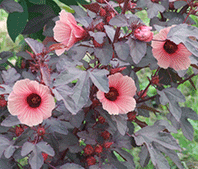 The leaf color of deep cranberry red is highly ornamental: the flowers are a small, very pretty, rose-pink hibiscus type. Cranberry hibiscus is a hardy plant that thrives when it is warm and wet. It prefers full sun but will grow in partial shade. It needs ample water, rich, fertile, well-drained soil that is kept mulched and a pH of 6.1-6.5. Food: A very nutritious vegetable; the leaves are high in vitamins B3 (niacin), B2, A, and C. It is high in protein and an excellent source of antioxidants and anthocyanins. The young leaves are known for their pleasantly tart flavor, eaten either raw or cooked. As the leaves contain oxalic acid, cranberry hibiscus should not be eaten in large amounts – e.g. as the only raw green vegetable in a salad – or more than once a week. Cranberry hibiscus leaves retain their color after being cooked. Flowers are used to making teas or other drinks where they contribute color rather than taste. In Central America, the flowers are combined with ice, sugar, lemon, or lime juice and water to make a purple lemonade. The vivid leaf color makes this a good choice as a background plant in ornamental beds. Hardy in U.S. Department of Agriculture plant hardiness zones 9 through 11, cranberry hibiscus grows quickly and requires spacing of 6 to 10 feet. Hope you find this edible gardening information interesting. Hibiscus Tea is amazing, it is grown and harvested here in Aswan, it is drunk cold for those with high blood pressure and hot for those with low blood pressure. It is a very refreshing drink. It is good to have genuine people in our lives makes all the difference and sharing with neighbours is good what I grew up with, such kindness seems to be getting rarer. Blessing Luda. You say absolute truth, Nanette. thank you for your comment and amazing medical fact. I will keep it in mind, and had no idea about the BP. Just amazing. Nor did until I lived here. delicious drink. The cranberry hibiscus is truly an amazing plant. Edible, drinkable as tea and beautiful! Any recommendations for flowers/pots to be inside home due to the cold weather approaching? Oh wow, what a great reflection. Appreciate you shared your thoughts with me. Do you want an edible container or colorful flower container :)? Herbs, such as rosemary will last a long time and will bring lovely scent to your house for the start :). Orchids would love the indirect sun from the window and will add on color, texture, shape and beauty. They are best at cleaning the air, and so are succulents-no care required :). There’s another Hibiscus, Rosella, which is very similar. Its buds are sometimes put in a glass of champagne here. Perhaps you could do that with yours. Beautiful plant and interesting to learn about its uses. Over here, we call it sorrel and I love it when it’s made into iced drinks. I have heard about this plant.. it’s interesting to know more about it!! Oh wow, I am so grateful. Thank you so very much. Have a wonderful day. Your pictures are so pretty and nice to read these new facts. Thank you! Ahhh, thank you dear Pragalbha! What a special memory. Kindness stays in people’s hearts forever. Hope your Monday is going well. My pleasure 🙂 Yes monday is wonderful as I catch up on the wp reader. Yes, quite fortunate. Thank you so much,Tom. Both the plant and its fruit are beautiful, and the color alone whets my appetite! Wonderful post! and it is lovely to have friends who gift us well! We call these roselles in Singapore. Beautiful. It’s great that you get to try a natural one than those instant full of chemicals. You’re lucky to have a thoughtful friend! Enjoy! Such a beautiful and useful plant! I like Hibiscus tea. Delicious. But I have never tasted the infusion made by myself from the plant. During a recent visit of two of my WP friends in Montreal we saw a variety of giant Hibiscus at the Botanical Garden. Beautiful species. So big that they seemed made of plastic! Your photos are gorgeous as always, Luda. Wow, now you make me want to visit it Montreal and it’s botanical gardens. Thank you for that suggestion and phenominal description. Thanks for your like of my “The Tithe – The Gift” post; you are very kind.